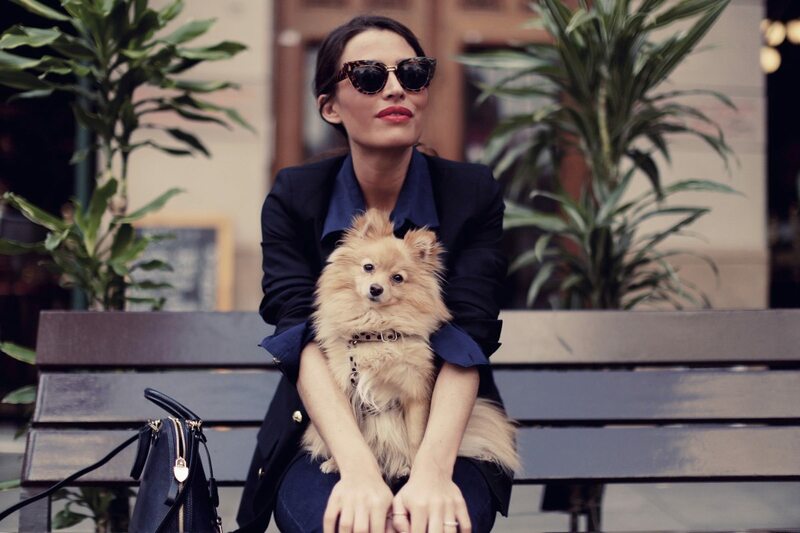 Audrey Leighton Rogers, 27, is the writer and blogger behind the hugely successful fashion and lifestyle blog, Be Frassy. She’s always been in my life, digitally speaking, from my first moments on Twitter and in the early days of my love affair with Instagram, Audrey has been on my mind. More so lately, since we’ve become Snapchat buddies, sharing dog selfies – her with Biba, me with Jake. Audrey is a girls’ girl, a freshingly honest bundle of fun who refuses to be defined by other people, yet is human and like the rest of us is susceptible to online negativity. She takes everything and makes it work for her. She just doesn’t give a f*ck and it’s this down-to-earth attitude in a sea of ‘fashion’ people who take themselves too seriously that makes Audrey so likeable. This is why I return to her blog every week to catch up on her wonderful writing and fabulous photos. I’ve said it before, but I’ll say it again: Audrey is an inspiration. Where are you from? I am originally from the USA but left when I was 8 and have been roaming around Europe ever since! Where do you live? I currently reside in sunny Barcelona, Spain but return to Paris, where I used to live on a monthly basis for work. What did you want to be when growing up? I always, always wanted to be a writer. Books were my best friends as a kid and they still are! What does your job involve? As a full time blogger, I juggle a lot of roles at once, photographer, stylist, writer, entrepreneur, try hard model and so on! What does your average working day look like? Usually, I spend early mornings out in the city shooting followed by admin and photo editing at home until around 7 pm. I like to work at night too, usually I clock in 15 hours day because I manage all sides of my tiny business on my almost with the help of two lovely women, one as a photo assistant and the other, as a brand manager. Best thing about your work? The flexibility and the creativity for sure! Worst thing about your work? No regular pay check. Some months I make bank, others I have to dip into to my savings for groceries or bills. Desk essentials? Wacom tablet, 3000 pens of which I only ever use 1, candles and notebooks scribbled with all kinds of nonsensical stuff. What has been your career highlight so far? I absolutely have no idea, probably the profitability of my website and being able to save money in a way I had never imagined my blog would allow me to. How have things changed since you started out? Blogging is far more competitive now, and not as down to earth as it used to be. I miss that a lot but at the same time, it has been amazing to watch us as industry grow to what it is today. I’m proud to be part of that. Who or what is your inspiration/motivation? My parents, definitely. My Dad was a come from nothing businessman who worked hard and retired before I went to University and my mother is the most creative, whimsical woman. I feel like they both taught me all the skills I use today in my own professional life. Best piece of professional advice you’ve received? Confidence comes from hard work, if you put in a consistent effort, you will become skilled in whatever you are doing professionally. Top tip for getting into the industry? Work hard, do things for free at first, I feel like so many young girls want to be ‘influencers’ purely for the lifestyle it might be associated with. But for me, what I do comes down to creativity rather than the bag I have or a place I might travel to, so prioritizing quality of content over all else would be my top tip. Something we don’t know about you? I am horribly afraid of being inside a shop when its closing, which means I refuse to step into ANYWHERE, even a supermarket unless its at least half an hour before closing time. Crazy, I know! Absolutely love these posts. Fabulous as always!